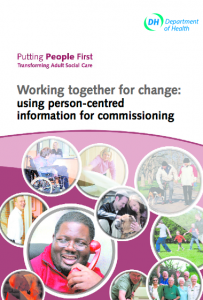 This report describes a simple six-stage process that uses person centred information (for example from person centred reviews, person centred plans or support plans) to drive strategic change and commissioning. Working together for change is a structured approach to engagement with people using services to review their experiences and determine their priorities for change. It is a systematic process for planning change with people, which provides powerful insights into what is working and not working in their lives as well as their aspirations for the future. It can be used to ensure that co-production with local people and families is at the heart of social care transformation programmes, as a vehicle to improve community engagement in the Joint Strategic Needs Assessment and as a tool for strategic commissioning.